Their hard work and passion embody their creations, and it is essential that they are complemented by a game-changing breakthrough that is not just sleek in design, but is also functional. During last week’s glamorous MEGA Fashion Week, it was discovered that three of the featured prominent designers are raving about one phone: Vivo’s latest revolutionary flagship phone, the V11. Impressed by the global brand’s newest offer, here’s what they have to say about Vivo’s innovative specs that supplement their impeccable talent. Prominent designer Neric Beltran praises the Vivo V11’s powerful Artificial Intelligence (AI) camera at the MEGA Fashion Week. Notable designer Neric Beltran commends the Vivo V11’s modern specs. “What I love about the phone is it has dual pixel sensor that captures crispier images of the stuff that I need for my designs. My clothes are statement pieces. They’re very ornate,” he says. Known in the fashion industry as a craftsman of edgy and avant-garde designs for celebrities both on TV and magazines, Mr. Beltran is a detail-oriented creator. He frequently features elaborate and refined cuts, as seen in his current collection. His symmetrical embellishments exude an idyllic yet modern look. This is the primary reason why he loves V11’s AI Camera so much, as it bears an Artificial Intelligence (AI) Camera that helps him pursue a perfect shot of his elaborate designs with a range of powerful photography features. It is equipped with a 25MP Front Camera and 12MP with Dual Pixel Sensors (24 million photosensitive units) + 5MP) Dual Rear Camera for superior photo quality. Talented local fashion designer Jerome Salaya Ang discusses the Vivo V11’s stylish design and functional specs at the MEGA Fashion Week. Distinguished designer Jerome Salaya Ang affirms his admiration for the V11. “I am a designer, and if an inspiration suddenly hits me, I have to be ready to take pictures. So what’s more important is your phone, the camera, it has to be very clear. So that’s why I choose Vivo,” he states. Jerome Salaya Ang is famous for his fabulous lace and tulle wedding gowns, as well as glass bead roping embroidery. His captivating collection is always evolving with a combination of various textures and volumes such as metallic pleats and cosmic bohemian looks. His respect for opulent femininity and charm comes with unexpected twists that are ultramodern and yet thrillingly luxurious. The V11 is a perfect smartphone for Mr. Salaya Ang’s needs. Its AI camera boosts photosensitivity both in backlight and low light situations. Just focus and snap, and the V11 will ensure that pictures will turn out clear and bright for the world to fully appreciate the craftsmanship behind every gown. 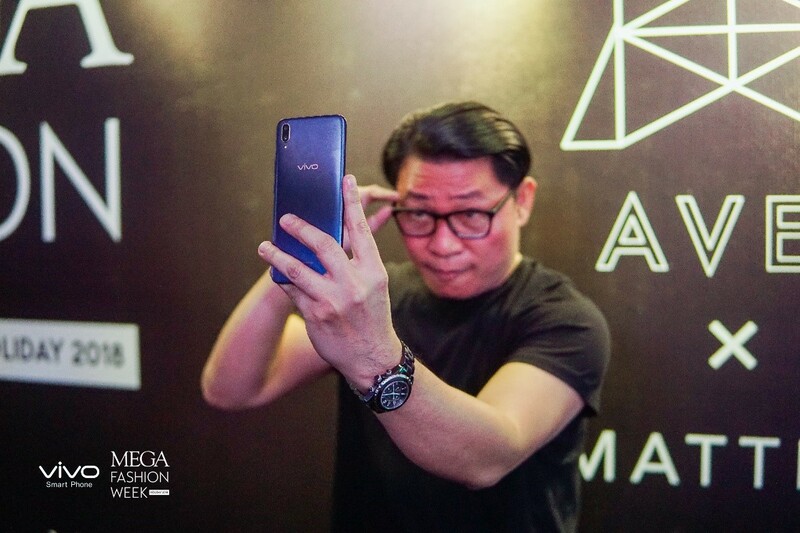 Renowned designer Avel Bacudio poses with the state-of-the-art Vivo V11 at the MEGA Fashion Week. Esteemed designer Avel Bacudio relates with Vivo V11’s finesse and practicality. “Vivo suits me more as an artist because all the details, even if you zoom in, will still be there. It’s clearer and the colors are more captured, and especially since I’m an artist, colors are important to me,” he declares. Multi-awarded designer and artist Avel Bacudio is a force in the fashion industry. Known as a design chameleon, Bacudio has utilized digital prints, architectural lines, and ready-to-wear garments that have reflected his unapologetic fashion-forward style. His pristine cuts and complimentary silhouettes have effortlessly established current trends on the global stage. Mr. Bacudio likes the V11 AI camera as it captures high-resolution photos that can withstand any situation. It has an AI Low Light Mode that makes it easier to take clear, bright photographs in dark environments with a simple point and shoot. The algorithm instantly captures up to six images and intelligently combines them to produce more details and reducing noise in low light conditions. Clearly, you can use V11 in your artistic endeavors. This smartphone is the perfect tool to express your creative skills through your preferred art form. Its futuristic and accessible features provide the best smartphone experience. Equip yourself with V11 now! You can pre-order the Vivo V11 in two ways: On ground and online. It is available in all participating Vivo concept and multi-brand stores. It will come with exciting freebies – a gift set (bluetooth speaker and earpiece with selfie stick), as well as 6 months extended warranty. Fans may also pre-order the Vivo V11 on shopping websites such as Lazada, Shopee, Argomall, and Akulaku. Freebies such 10,000 mAh game power bank, a gift set (bluetooth speaker and earpiece with selfie stick), as well as 6 months extended warranty will be included.